Microsoft has been very tight-lipped about the price of its Microsoft Surface range of tablets. With a launch set for later this month, speculation has intensified, with some sources stating a price less than $399 for the RT version. As we did for the rumored iPad Mini, let's get to a more educated estimate of the BOM cost and pricing for the Surface RT & Pro. NAND Flash Memory & DRAM - The BOM estimates for the Kindle, Fire, Nexus 7 & iPad show that there is a linear relationship between price and storage capacity. Therefore, the Surface RT's 32 GB storage would be quite a bit pricier than competitors. Also, assuming 1 GB of RAM, the DRAM cost would be the same as that for the 3rd gen iPad. Display - The display cost is primarily dependent on two factors - screen size (area) & pixel density. From our previous estimate for the iPad Mini, we know that the display cost per pixel per sq. inch is about $0.010. We also know that the Microsoft Surface RT has a 10.6 inch HD display (not full HD) - this would put the resolution at either 1280x720 or 1366x768. In order to be conservative, let's assume the former, which gives us a pixel density of 139 PPI. This would imply a cost of roughly $67. Touchscreen - From our previous estimates, we know that touchscreen cost is directly proportional to diagonal screen size. Using a 10.6 inch screen size, we can estimate a cost of roughly $44. Processor - Microsoft has announced that the Surface RT would use nVidia's Tegra 3 processor. I've assumed this cost to be the same as the version of the Tegra 3 used in the Nexus 7. Even though this is most likely not the version with the low cost Kai design, the cost of the processor itself is unlikely to be very different. Battery - Battery cost is basically directly proportional to storage capacity. 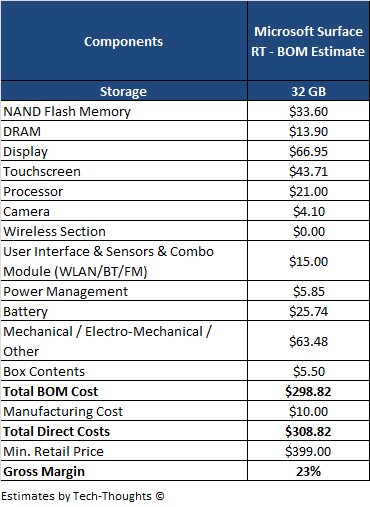 Based on the cost estimates for the iPad, Nexus 7 & Kindle Fire, we know that the cost per Wh of storage is roughly $0.82. The 31.5 Wh battery in the Microsoft Surface RT gives us a cost of about $26. Mechanical / Electro-Mechanical / Other - The enclosure/casing would make up the majority of the cost of this component. Microsoft has adopted a magnesium chassis for the Surface, because of capacity issues plaguing the originally planned magnesium-aluminum casing. Assuming that processing cost remains proportional, the cost of the casing basically depends upon two factors - type & amount of material used. 1) Type of Material - Magnesium is more expensive than aluminum, at about $3,200 vs. $2,000 per metric ton (would be procured in bulk by component manufacturers). However, magnesium is also about 33% less dense than aluminum, which means that magnesium's cost per unit volume is only about 10% higher than that for aluminum. 2) Amount of Material - Assuming that the dimensions of the Surface Tablet are larger than the iPad and are in the same proportion as the screen size, we can get a surface area ratio of the iPad & Microsoft Surface. In order to compare material thickness, we also need to take into account the Microsoft Surface's kickstand. As opposed to doubling the thickness of the casing in the bottom half to accommodate the kickstand, Microsoft could choose to increase the total thickness by a smaller proportion. We can conservatively assume the average increase in the thickness of the casing to be about 15% over the iPad. Based on these inputs and a $47.8 cost of the iPad 2's aluminum casing, we can estimate a cost of about $60-65 for this component. Of course, this estimate excludes the cost of the VaporMg Surface Treatment & any cost impact due to low yields. This means that the cost of this component could see the widest variation. Camera, User Interface, Sensors, Combo Module, Power Management, Box Contents & Manufacturing Cost - I have assumed these costs to be the same as that for the 3rd generation iPad/iPad 2 as they are unlikely to be very different. 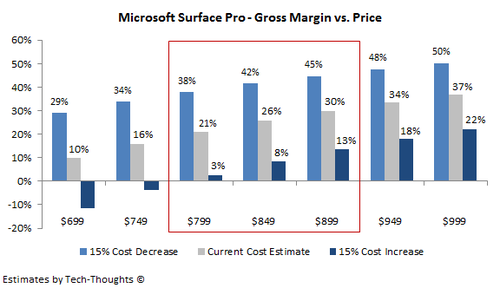 As compared to Apple, Microsoft's pricing decision with the Surface range of tablets depends less on their gross margin and more on their OEM partnerships. Microsoft would be under considerable pressure to ensure that the Surface is priced in the same ballpark as tablets from OEM partners. Unfortunately, OEMs are also at a cost disadvantage as they need to pay Microsoft a license fee of $50-$65 per Windows RT device. OEMs could cut some of the costs mentioned in the BOM above to boost margins (for example, they could use a cheaper casing), but Microsoft's hardware requirements could make steep cuts a challenge. Including the license fee, I expect the BOM of most Windows RT tablets to fall within the $300-$350 range. Based on this, I expect the Surface RT to launch at a price of $399-$499 (excluding the smart cover / keyboard), giving Microsoft a gross margin of roughly 25%-35%. I expect most Windows RT tablets to be priced at the same range as well, with comparable margins. 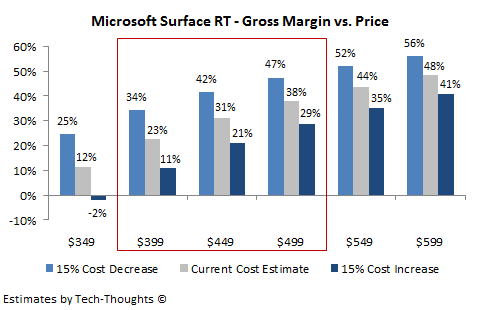 Now that we've estimated the gross margin and price for the Surface RT, let's use this as a base to get a rough estimate for the Surface Pro as well. At a minimum, the Surface Pro should add about $320 to the Surface RT's BOM. The primary culprit for this increase would be the Intel Core i5 processor that costs about $200 more than the Tegra 3. 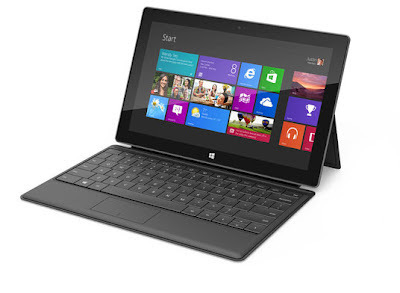 OEMs would also have to pay a license fee of about $60-$100 for each x86 Windows 8 tablet. Luckily, OEMs have more avenues to cut costs here as they could opt for a cheaper Atom or Core i3 processor, saving about $80-$160. Based on this, I expect the Surface Pro to retail for $799-$899 (excluding the smart cover / keyboard) with a gross margin of roughly 25%-30%. Most mid-range x86 Windows 8 tablets should retail at the same price (with higher gross margins), with high end models (specs comparable to the Surface Pro) priced around $1000. I think Microsoft uses a high-end c&k switches to be able to produce a more improve program and software for the OS they generated the windows 8. I think the laptop producers are using some laser tools on this one to be able to fuse all the tiny and molecular-like pieces of it. I can imagine all the efforts the creators of these gadgets in producing such a useful product.